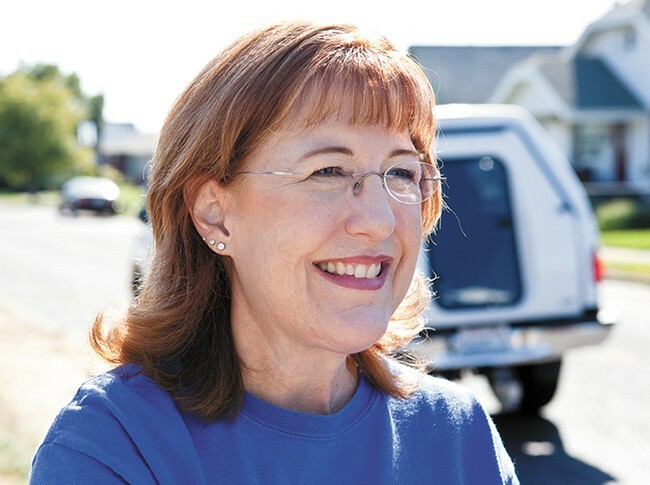 Former Spokane City Councilwoman Nancy McLaughlin knew it would be a tough primary election. Even after the Spokane GOP chose her to fill the commission's vacated seat earlier this year, she knew legislative aide Josh Kerns — who was the Spokane GOP's second choice — and Spokane City Councilwoman Candace Mumm both posed a challenge. She was right. Mumm, a Democrat, took 40 percent of the vote in the primary and will move on to the general election for a seat on the Spokane Board of County Commissioners, according to the latest results. Kerns had 31 percent, and McLaughlin just 28 percent, leaving her out of the running. Though all of the votes haven't yet been counted, McLaughlin says realistically she doesn't see a turnaround. "The most disheartening thing is that it looks like I'm going to be taken down by a portion of my own party," McLaughlin tells the Inlander. "It's disheartening that a portion of my party would take me down, while the other portion of my party didn't really believe I was at risk of losing." McLaughlin was reluctant to throw her name in for the job back in January at all, at the time saying she wasn't sure if she had "the fortitude to put up with a possible 10 months of drama." As the campaign went on, she says she tried to convince people in her own party she needed more help. "They didn't get it. They were so convinced that [they would say], 'Nancy, you have a great history, people love you,'" she says. "I kept thinking: No, I need help, you guys." Still, by the end of the primary, she ended up raising more than three times the money Kerns did. But it was Kerns' message that ultimately resonated more with conservative voters, not McLaughlin's. It came as somewhat of a shock to some people, including Mumm, who says she's "a little surprised that someone with no political or elected experienced would be my challenger." Kerns has experience running a campaign. This may be the first time Kerns has been up for election, but he is no stranger to campaigning. He managed the campaign of former state Rep. John Ahern, then for Rep. Jeff Holy in 2012 and 2014 before becoming Holy's legislative aide. He earned endorsements from Sen. Michael Baumgartner and Rep. Matt Shea. "He's obviously been in the political game," says Dave Moore, chairman of the Spokane County Republican Party. Moore says the fact that McLaughlin was already working as on the board of commissioners could have been a hinderance. McLaughlin acknowledges that Kerns hit more doorbells than she did, and that it at times was difficult to do the job, run her campaign and "still have a family life." Kerns says it could have played a factor, but that "commissioners find a way to get out there" anyway. "Nancy was busy doing her job as county commissioner and Josh had a little more time [to knock on doors], which is very important at this stage," Moore says. McLaughin's record was used against her. McLaughlin was always a conservative voice on Spokane City Council, but Kerns used McLaughlin's record to portray himself as the candidate who will always protect conservative values on the county commission instead. He implicated McLaughlin in the wage increase for city councilmembers that increased their salaries from $18,000 to $30,000, since McLaughlin proposed the creation of the Salary Review Commission that raised the salaries. In mailers, he made McLaughlin out to be a "career politician." McLaughlin calls it "twisting the truth." She notes Kerns, as a legislative aide, makes somewhere around $50,000 a year. And she says if anything, Kerns is setting himself up to be a career politician. She wasn't elected to city council until her mid-40s, whereas Kerns "worked at Red Robin and then worked in government." "I think he was successful at twisting the truth," she says. "And I hope people will remember that when they consider his integrity." Kerns jumped on McLaughlin's silence on the Central City Line. The Spokane Transit Authority has a proposed sales-tax increase of up to 0.2 percent on the November ballot for projects that include the Central City Line, an electric bus route that would run from downtown to Spokane Community College. Mumm says she will vote for the sales-tax increase. Kerns is against it. But McLaughlin never made up her mind on the issue. Kerns criticized her for the indecision. "Well, Nancy, you say you don't support new taxes, but you won't tell us whether you support a $200 million sales tax increase," he told the Inlander before the primary vote. The Urban Growth Area settlement put McLaughlin at center of a debate. Spokane County commissioners, including McLaughlin, signed an agreement earlier this year that settled lawsuits with neighborhood associations. The agreement locked in the current urban growth boundary until 2025, and means the county must accept lower population growth forecasts that could limit further expansion of the UGA. Kerns criticized the settlement because he thinks without expansion home-buying will be more difficult. But McLaughlin says the lawsuits — four of them in total — were draining taxpayers of money and that the county "was not going to come out well." That made the settlement necessary, she says. Meanwhile, Mumm takes the stance that the county should be building inside the Urban Growth Area. In mailers, she made McLaughlin out to be bought for by developers, a sentiment McLaughlin strongly resists. "It was an attack from both fronts," McLaughlin says. McLaughlin says she won't endorse either Kerns nor Mumm "out of personal convictions of the lack of level of integrity." McLaughlin says she has no plans to pursue any other elected office. "Politics is politics. I want to leave on a note that people know that I am a woman of integrity. First, a Christian. Second, a conservative. And thirdly, a Republican," she says. Kerns says he has no anger towards McLaughlin. "I want to commend her for the things she did do on city council, like the initiative to put in a supermajority for tax increases. I thank her for that," Kerns says. "We've always been friends since we met and I have no desire to see that change as we move forward here." As for Mumm, she says she feels good heading into the general election, even though she was expecting to face McLaughlin. "I look forward to a good campaign with [Kerns]," Mumm says.